A large part of the original "Cotton Belt". This was considered to extend from eastern North Carolina to South Carolina and through the Gulf States as far west as East Texas, and including those parts of western Tennessee and eastern Arkansas in the Mississippi embayment. Some of this is coterminous with the Black Belt, originally referring to upland areas of Alabama and Mississippi with fertile soil, which were developed for cotton under slave labor. The term came to be used for much of the Cotton Belt, which had a high percentage of African-American slave labor. 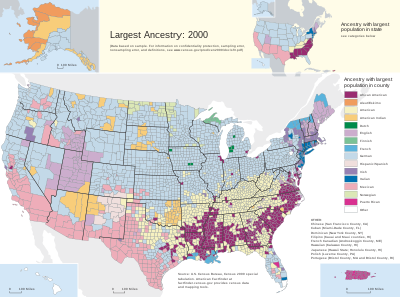 In the 1980 census, of those people who identified solely by one European national ancestry, most European Americans identified as being of English ancestry in every Southern state except Louisiana, where more people identified as having French ancestry. A significant number also have Irish and Scots-Irish ancestry. These figures to do not take into account people who identified as "English" and another ancestry group. When the two were added together, people who self identified as being of English with other ancestry, made up an even larger portion of southerners. South Carolina was settled earlier than those states commonly classified as the Deep South. Its population in 1980 included 578,338 people out of 1,706,966 people in the state who identified as "English" only, making them 33.88% of the total population, the largest national ancestry group by a large margin. One opinion piece attributed the political and cultural changes, along with the easing of racial tensions, as the reason why southern voters began to vote for Republican national candidates, in line with their political ideology. Since then, white Southern voters have voted for Republican candidates in every presidential election except in the 1976 election when Georgia native Jimmy Carter received the Democratic nomination, the 1980 election when Carter won Georgia, the 1992 election when Arkansas native and former governor Bill Clinton won Georgia, Tennessee, Louisiana, and Arkansas, and the 1996 election when the incumbent president Clinton again won Louisiana, Tennessee and Arkansas. In 1995, Georgia Republican Newt Gingrich was elected by representatives of a Republican-dominated House as Speaker of the House. ^ Frank D. Bean; Gillian Stevens. America's Newcomers and the Dynamics of Diversity. p. 213. doi: 10.7758/9781610440356. ISBN 978-1-61044-035-6. JSTOR 10.7758/9781610440356.